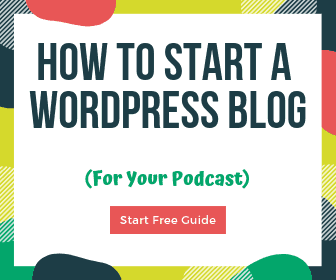 Whether you’re shooting video or recording a new podcast episode, you need to make sure you have great audio quality. The good news is that for the last couple years, video quality included with your Android smartphone is probably top-notch. But the built-in microphone in your Galaxy or Pixel phone just won’t cut it. 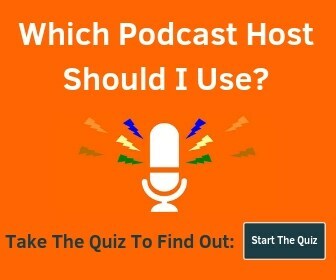 There are several excellent external microphones that will work with your Android phone – and there are different styles depending on your needs. 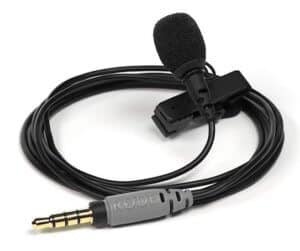 The most popular option that works well in a variety of situations is a lavalier mic (they clip to your shirt, allowing hands-free use) but there are a few shotgun-style mics that plug into the headphone jack (if you have one) as well. 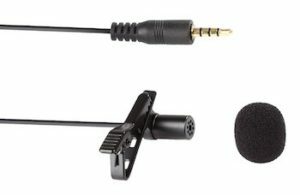 You can also use other microphones that are designed for digital audio recorders or DSLRs (like these on-camera shotgun mics) but you will need a TRS to TRRS adapter to plug them in. This post will just focus on microphones that don’t need adapters to keep things simple, but I wanted to point out that there are many options to improve your audio quality. 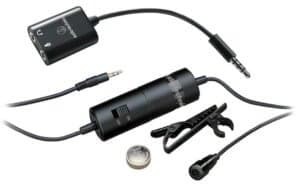 We also have a separate article specifically for iPhone mics (with many options that use the Lightning connector) if you find yourself needing one of those too. The Rode SmartLav+ is a popular choice for smartphone recording. You’ll get great sound quality backed by a well-respected brand in audio. The cable is reinforced, it comes with a pouch, clip, windscreen, and a 1-year warranty. With a “best-in-class” signal-to-noise ratio, long cord, and solid brand, the Shure MVL is an excellent choice to improve your Android’s audio quality. The Audio-Technica ATR3350iS has a headphone jack connection and a TRS connection so you can use it with any device you wish. It works great and doesn’t cost a ton, but it does require a small battery so make sure you pick up a few extras. I’ve forgotten to turn it off before, which obviously drains the battery. Just something to consider. The cheapest smartphone lav mic of the bunch, the Movo PM10 will greatly enhance the audio quality over your built-in phone mic. The Rode VideoMic Me is a mini shotgun mic for your smartphone. 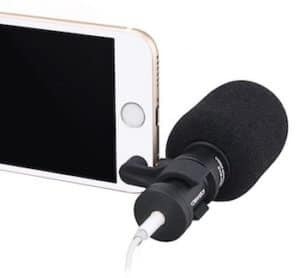 It has a headphone jack on the back so you can listen to your recording live, a flexible mount that allows you position it on any phone, and they throw in a windshield to reduce noise while outside or when moving your device quickly. This is an awesome little device – highly recommended! The Comica CVM-VS08 is a cardioid condenser shotgun mic. It has an adjustable mount, a pass-through headphone jack, a windscreen (pictured), and a furry windshield. A flexible option that’s a little cheaper is the Saramonic SmartMic. The build quality and audio quality isn’t quite up to the same level as the other options above, but it is absolutely an increase over not using an external microphone. But most new Android devices as of 2018 don’t have microphone ports, as they’ve decided that Bluetooth is the way to go. 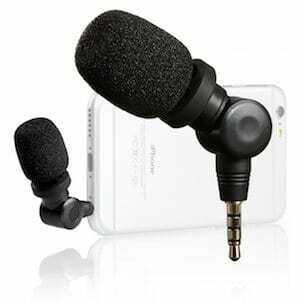 Have you ever found a Bluetooth mic that will pair with an Android phone and allow audio recordings? Ya lavalier mics work pretty well with an adapter, but some of those shotgun-style mics are a little tricky. 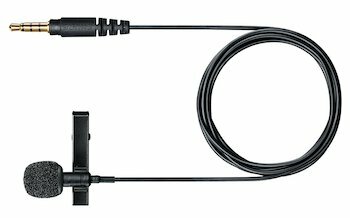 I recently added a couple bluetooth and wireless mics in this Lavalier Mics post. Hope that helps. Apple’s Airpods work really well on Android too. 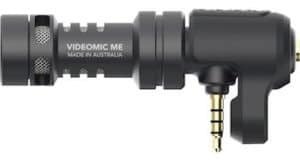 Most websites, like this one, recommend the Rode VideoMic Me for smartphones. However, it is usually overlooked that to use this product, your headphone jack has to be on the opposite side of your phone from the camera lens. Every phone I’ve used has the headphone jack and camera on the same side. This means that the microphone itself sticks into the frame and blocks part of the video – especially if you use the windshield. Thanks for writing such an impressive and interesting article. I am completely agree with doug, in most of the phones microphone jack is present at upper side of phone which most of the time covers the camera. That is why Using XLR Connectors and Microphones becomes difficult sometimes.